Dennise is one of Australia’s most celebrated international golfers & golf coaches and was awarded by the PGA Teaching Professional of the Year NSW /ACT on 28th February 2013. This is the first time any woman in Australia has won such an award. Dennise Hutton is a graduate of the University of New England, majoring in Psychology and Education. She also has a Diploma in Education from Sydney Teacher’s College. She has over 25 years of teaching experience from which her students can benefit. Dennise is one of the most highly qualified and experienced golf professionals, both as teacher and player. She has had notable success winning the 1986 and 1987 Australian LPGA Championships and in 1989 she won two tournaments on the European Tour, The European Match play Championship and the French Biarritz Open. That year, Dennise was ranked No.5 on the European Order of Merit and No.1 Australian worldwide based on tour earnings. Dennise has represented Australia 12 times, and NSW numerous times and in total Dennise has won over 40 events world-wide. She was the first woman named in the Top 50 Coaches in Australia by Golf Magazine. Today she is still ranked in the Top 50. Dennise has over 80 golf articles published. She is accredited with the Australian Coaching Council and has a L.P.G.A V.E.T.A.B Certificate. She was President of the Australian Ladies Professional Golf Association (LPGA) for 5 years and in 2000 was awarded the Australian Sports Medal. Dennise is also a qualified club fitter. Over the years she has studied and worked with leading golf professionals, contributing to her success as a tournament winner, both nationally and internationally. She’s a qualified Golf Coach, Life Success Coach, and is also a Speaker and Presenter. She was the coach of the Womans World Cup Team 2010, Asia Pacific Team 2009 /2010. She was appointed State Coach until 2012 and has been recently appointed Coach of Australian Youth Olympic Team 2013. 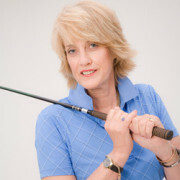 Her passion is to empower each golfer to reach their golfing goals in the quickest most efficient way and this is why she is a StressAce Golf Coach. She believes that harnessing the power of the mind is the answer to dramatic and effortless results in golf. She wants her students to enjoy their golf, have fun, keep their confidence and achieve good scores consistently – whether their goal is to be the world’s number one golfer, or to not feel embarrassed when on the tee. She tailor makes training packages and teaches in a friendly, safe and stress free style. When you train with Dennise all aspects of the game, including the swing as well as vital short game skills are covered. You learn how to practice, play the course, and analyse your rounds.